You seldom see Jesus approaching the rich in the Gospel. He took time to visit a dying servant (though he found her dead on his arrival) and personally visited Peter, James and John to invite them to be his disciples, but I don't remember him taking time to visit the rich or those in high positions. In Luke, he said "Blessed are the poor" and in another instance he praised a poor widow who gave her last two small copper coins, while belittling the donations of the rich. Except for one guy---Zacchaeus, I often wonder why Jesus stayed away from the rich. What did he see in Zacchaeus to invite himself to his house, even saying, "I must stay at your house today." Was it because Zacchaeus wanted to see him? But other rich people wanted to see him, too. Nicodemus wanted to see him, but Jesus never invited himself to his place. I think it was Zacchaeus' death-defying tree-climb that prompted Jesus to want to stay at his place. Seriously. With his height, climbing trees was death-defying for Zacchaeus. Moreover, have you seen a wealthy man climb a tree for someone? I haven't. 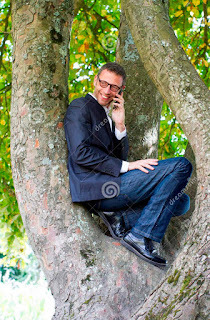 Can you imagine Bill Gates or Prince Charles joining the crowd and climbing a tree just to see me (or an ordinary fellow) pass by? Here are my radical e-books on Christ. Click here! Rich people would probably do it today for Jesus (if Jesus were here today). but back then when Jesus was a poor nobody? No way. I can't imagine them even standing among the crowd under the hot sun just to see a nobody like Jesus pass by. Aside from discerning Zacchaeus' heart---that he was ready to repent and even lose most of his wealth for Jesus---the Lord saw how Zacchaeus waited with the crowd (he even "ran ahead" of it) and climbed up a tree just to see Him pass. I can imagine how Zacchaeus even waited a long time for Jesus to pass by. He didn't know exactly what time Jesus would pass by, so he had to wait. Such excitement to see Jesus is rare among the rich, in fact even among church people. Church people are willing to join the crowd during worship in church on Sundays, even be active in church, but would they be excited and willing to run ahead of the crowd and climb up trees for Him? Jesus looks for that in a person---the excitement to simply see him and the willingness to do anything (or lose anything) just to see him. With his height, Zacchaeus wouldn't stand a chance against the crowd. But this didn't stop him. He did the unthinkable---he did what the rich are never expected to do. He'd be cruelly criticized or rejected by his society for the indecent and ridiculous deed, and do all that just for this nobody named Jesus. If Jesus sees this radical excitement and willingness in you, he'd call out your name and invite himself to stay at your place. There were thousands of "worshipers" who worshiped good in the temple in those days. But Jesus never invited himself to their homes. The era of worshiping with the crowd is old school and the kind of worship Jesus looks for is one that would get out of the crowd, run ahead of it, and "climb up trees"---or do something radical and detestable to religious people or the "decent" people of this world just for the simple goal of seeing Jesus. The rich have a special place in Jesus' heart, too---if they are willing to be poor-in-spirit like Zacchaeus.